Reverend John Wilkins was born in Memphis, Tennessee on 10th October 1943. His father was the phenomenally talented and revered Robert Wilkins from Hernando, Mississippi who had recorded blues during the 20�s and 30�s. It was his Brunswick imprint of �That�s No Way To Get Along� that the Rolling Stones would cover for their �Beggars Banquet� album. By then Robert had forsaken his life as a bluesman for over thirty years and had re-recorded this number for the Piedmont Label in the 60�s as a gospel song entitled �Prodigal Son�. On Sundays Robert and his wife, Ida Mae, would take their seven children to church to sing, pray and socialise. John was, however, the only child to show an interest in playing a musical instrument and on the strength of this his father bought him a guitar and he was soon playing alongside him in church. Robert�s guitar playing had remained unaltered since his days as a blues icon and his parishioners were happy with the holy blues tradition. John, who had been taught by his father, had never for one moment had the slightest qualms about following in his father�s style. About this time gospel music began to be influenced by R&B, so John found himself heavily in demand with various local gospel groups who wanted to add that �little blues spice� to the sound. By the time John was sixteen he was also listening to local blues and R&B bands both live and �on air� and it was just a matter of time before he was approached and eventually asked to join one of them. Each weekend John would travel down to Independence, Mississippi for the bands weekend gig at a country �Gaming� house. �Played all night Friday, all night Saturday and then made sure I got home early Sunday to accompany and sing with the gospel quartet�s at Daddy�s church�. From 1950 through 1963 John spent most of his time hustling gigs with bands in clubs like Dinos, The Flamingo Lounge and the Club Handy often finding himself backing out of towners including the great James Carr. He also started hanging around the various Stax recording studios in and around Memphis picking up work as a studio musician. The wealth of talent in Memphis at that time was so great and overwhelming that often he would be unaware who the artists were that he was backing! During all this period he still worked in gospel quartets and began a twenty-year gig with the M&N Singers. In 1963 he met and befriended O.V Wright who was looking for someone to play guitar at a recording studio for Don Robeys Backbeat Label and this time John does remember playing on O.V�s first secular recording �You Gonna Make Me Cry�. 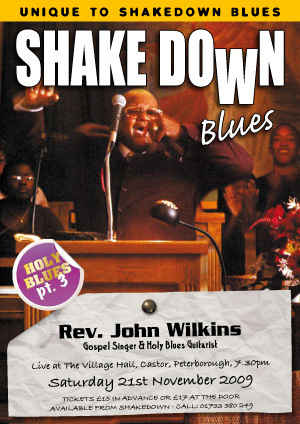 After that John Wilkins quit the blues scene and exclusively played with gospel groups. From then on he immersed himself in the church. In 1983 John was ordained and he is currently the pastor of Hunter�s Chapel Missionary Church just outside Como, Mississippi where both Fred McDowell and Napoleon Strickland are buried. As part of his pastoral duties John is able to combine his love of motorbikes and the Lord by becoming the official National Pastor to the King Riders Motorcycle Club where he is known as the �Biker�s Preacher�. Now at 66 John has now recorded a CD of religious songs in the Holy Blues Tradition of his father and is travelling throughout the US playing in clubs and festivals. Two years ago we had booked John for a couple of gigs and for a variety of reasons -mainly due to health and passport problems - he cancelled at the last minute - I filed him together with Mem Shannon, Mel Brown and John Dee Holeman under the banner 'Might have been great nights'. Then a chance comment by Terry Bean that he had met and befriended a wonderful preacher, gospel singer and guitarist called The Reverend Wilkins 'who would be perfect for a Shakedown gig'. I immediately looked though my file and 'phoned John who apologised for the problems two years ago and said he would be delighted to play for us this November. This was his first trip abroad and a great coup for Shakedown Blues. �Been a long time coming�!